Point No. 1) Queen Victoria and Tubby brands of spinach have been recalled. Point No. 2) Who would name a spinach brand Tubby? That's the message the California Department of Public Health sent Friday as part of a recall of two spinach brands. "Queen Victoria" and "Tubby" -- distributed by Ippolito International LP of Salinas -- have been put on notice after testing positive for Salmonella. 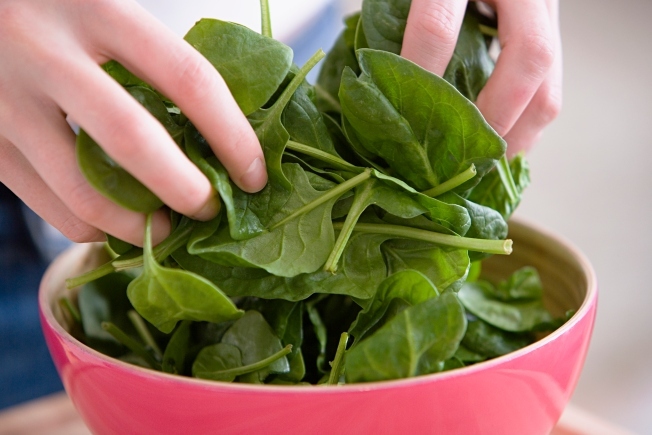 Of the 1,715 cartons of recalled bunched spinach, 1,515 were packed under the "Queen Victoria" label and distributed in California, Alabama, Arizona, Florida, Georgia, Illinois, Indiana, Kentucky, Michigan, Minnesota, New Jersey, New York, and, in Canada, British Columbia, Ontario, and Manitoba, the statement said. The remaining 200 cartons were packed under the "Tubby" label and distributed in California and New York. The recalled spinach was harvested Sept. 1 through Sept. 3 and distributed to retail, food service and wholesale buyers, the Department of Public Health reported. It was packed in 12-count and 24-count bunches in cardboard boxes with "Spinach" printed on the side panel, in wire bound crates, or in reusable plastic containers. The 12-count and 24-count spinach bunches were bound with a twist tie which says "PLU 4090 UPC 33383-65200," according to the agency's statement. The recalled bunched spinach was labeled with the following Code Date Stickers, located on the outside edge panel of the carton: 10522441 5 205 (harvested Sept. 1, 2009); 10522451 5 205 (harvested Sept. 2, 2009), and 10522461 5 205 (harvested Sept. 3, 2009). The Tubby label was packed only on Code Date 10522451 5 205. No illnesses have been reported so far. Consumers with questions should contact Ippolito International, LP at 831-772-9991.